A good friend of mine recently started a new phase in professional career. I was thinking about this Sunday afternoon. It's an easy thing to do. I am constantly reminded of his little boy, Enzo, through a series of Christmas picture cards that have been adorning my refrigerator door for several years now. I can see Enzo at one, the family at two and then Enzo again at three. Do they grow fast, and boy do those little men get handsome quickly ! Can't wait for the next set of photos. But it is more than the a photo collection that reconnects me to my friends. Madhav and Sandra. A very popular wine within my circle of friends also often reminds of especially good times. We were introduced to the wine not by chance. Enzo's parents held their wedding reception at Cline Wineries in Sonoma California. We still talk about the event. At the wedding , a very multi-ethnic and multicultural event - including east coast and west coast folk - ate and danced under the protectorate of huge oak barrels that lined the walls of a "cantina" turned into a super festive wedding hall. Memorable party! Memorable party. As you drive up Highway 121 and approach the winery's gates , you will notice an old truck parked out near the front. No, it's not a sign that you have entered redneck country, but it is a part of the Red Truck wine branding. Red Truck labels itself as one of America's top value wineries. As a loyal customer I can attest to that , and so can my friends. Check out their website to get a more concrete sense of their product line: Red Truck Wine, Sonoma California. What I like most about Red Truck is the consistency of flavor from year to year. This medium bodied red - that's at least what I consider it - always brings me back in time to my wine making years in Italy. Red Truck's finish leaves me with mellow and gentle hints of sweetness, reminiscent of pomegranate and honeydew melon that I simply tells me have another glass. So go out an buy a few bottles. Now back to cooking and put it all back together. Enzo , check . Wine , check . Main course ? That's easy . Artisanal rigatoni imported from the Italian region of Abruzzo with a fresh tomato sauce made from those red roma tomatoes that I always keep in my vegetable basket. As to recipe, well folks, search the archives. I think I wrote about recipe this in the past. Just one recommendation. 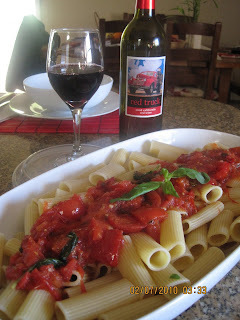 This type of tomato sauce goes best with some Parimiggiano Reggiano, kept at room temperature. So best of luck , my friend with your new venture. Salute !